You can delete SharePoint libraries when you no longer need them. When you delete a library, you also delete documents, metadata about the documents, version history, library settings and specific permission levels that are associated with the library. If you delete one by accident or change your mind, depending on how your site is set up, you can restore a document library from the recycle bin. For more info, see Restore items in the Recycle Bin of a SharePoint site. To create a library, see Create a document library in SharePoint. Navigate to the library you want to delete. In the settings page, click Delete this document library under Permissions and Management. If you're sure you want to delete the library, click OK. 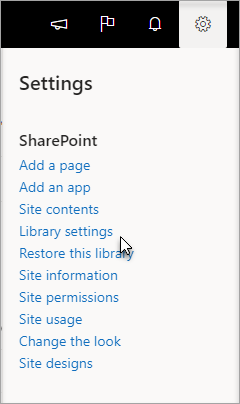 Note: The title of the dialog may vary whether you're using SharePoint Online, or SharePoint Server 2019. Click the Library tab on the ribbon and then click Library settings. Hover and click the ellipsis (...) for the library you want to delete and then click Settings. On the settings page, click Delete this document library under Permissions and Management. Click the name of the library on the Quick Launch, or click Site Actions , click View All Site Content, and then under the appropriate Libraries section, click the name of the library. For a picture library, On the Settings menu , click <library type> Library Settings. For other libraries, under Library Tools, click the Library tab, and then in the Settings group, click Library Settings. Under Permissions and Management, click Delete this <library type> library. When you are prompted to confirm the deletion, click OK if you are sure that you want to delete the library. If the name of your library does not appear on the Quick Launch, click Site Actions , click View All Site Content, and then click the name of your library. Under Permissions and Management, click the option to delete your type of library. For example, in a document library, click Delete this document library. Delete a file, folder, or link from a SharePoint document library.